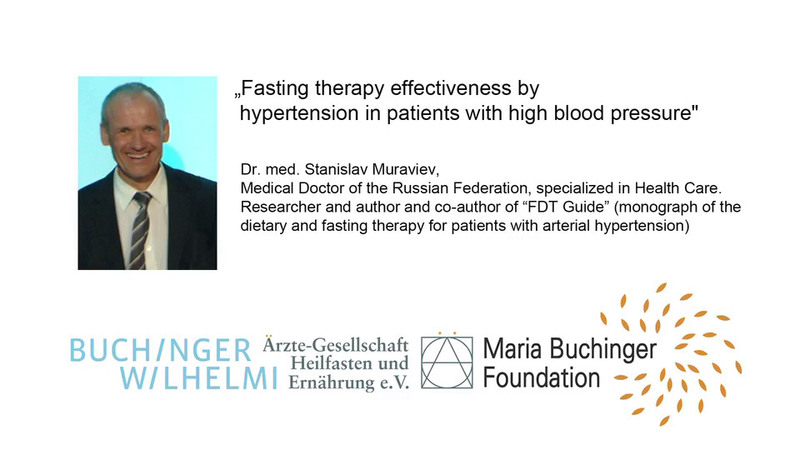 We held an open prospective study of 285 patients arterial hypertension (AH) 1-2 degree with fasting therapy course (FT) by Prof. Yuriy Nikolaev, from 1998 to 2009 years. The course consists of 12.7 ± 0.8 days on average. 8. Laboratory research methods: definition of daily and morning microalbuminuria, glomerular filtration rate, uric acid, nitrogenous waste, lipids and blood ions. a.i.1. FT can reach patients AH target level of blood pressure in 86.7% of cases, significantly reducing the rate of systolic blood pressure rise in the morning at 24.2% and increasing the share of persons with an adequate night fall in ABP. a.i.2. After a course of FT increases tolerance to physical activity and decreases total peripheral vascular resistance at 12.5% and significantly increases the total power spectrum of heart rate variability at 22.7% of patients 1-2 degree AH with obesity. a.i.3. Using the FT results in significant improvement of left ventricular diastolic function (in 37% of cases significant improvement of diastolic function, and in 8% of cases the normalization), while maintaining global systolic function in patients with AH, the reserve has improved diastolic left ventricular. After 1 and 6 months after the course of loading-light therapy in patients with arterial hypertension 1-2 degree with obesity is reduced initially pathological mikroalbuminuria (12%) to and increased by 38% of patients with normal glomerular filtration rate. According to the ultrasound Doppler study in patients with arterial hypertension in 1 month after the course of FT renal vascular resistance decreased by pulsatility index on segmental and interlobular renal arteries. FT has beneficial effects on linear indicators of cerebral blood flow by Ultrasonic Doppler data, positive results are retained for 6 months after treatment. According to the positive FT effects on atherogenic lipid fraction, left ventricle diastolic function, renal and cerebral blood flow, microalbuminuria, FT is recommended for patients AH 1-2 degree with the associated obesity, hypertensive nephropathy and left ventricle diastolic dysfunction.